Miriam Mason Martineau is a mother, therapeutic counselor, parenting coach, writer, speaker, and researcher. She has spent the last 20 years studying and applying Integral-Evolutionary theory, educational frameworks, and spiritual practice. Miriam holds an M.A. in Psychology from the University of Zurich, with specialization in Youth and Child Psychology, and has been working in private practice as an integral therapeutic counselor since 1995. She is presently writing a book on Integral Parenting called Raising the Future: Parenting as a Spiritual Practice and is passionately interested in parenting as a spiritual path — both in theory and in practice. 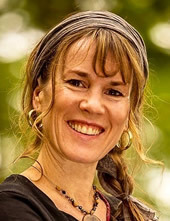 Miriam is vice-president of Next Step Integral, an international organization that brings an integral perspective to ecology, education, parenting and community. She writes for the Huffington Post, and has articles and chapters published in several magazines and books, including The Journal of Integral Theory and Practice, Igniting Brilliance: Integral Education for the 21st Century, and Cohering the Integral WE Space: Developing Theory and Practice for Engaging Collective Emergence, Wisdom, and Healing in Groups (forthcoming). Miriam offers workshops, speaking engagements, counselling for individuals and couples, as well as parent coaching and an online parenting course.